Because of a PhD oral exam that I must take part in, office hours on Tuesday, April 9th will be rescheduled from 4-5pm to 5-6pm. Because we have not yet discussed interior and boundary points as of 2/13, the problems from Section 13 on Problem Set 2 are now "practice" problems, not to be written up. Due to inclement weather, office hours on Friday, February 8 are canceled, lecture on Monday, February 11 is canceled, and Problem Set 2 and Quiz 2 will not be collected / held until the week of February 18. The first in-class quiz will be held on Wednesday, January 30th. This will be a diagnostic quiz on your understanding of calculus, foundations and proof. Course Description The description in the graduate bulletin: Topics in differential calculus, its foundations, and its applications. This course is designed for teachers and prospective teachers of advanced placement calculus. 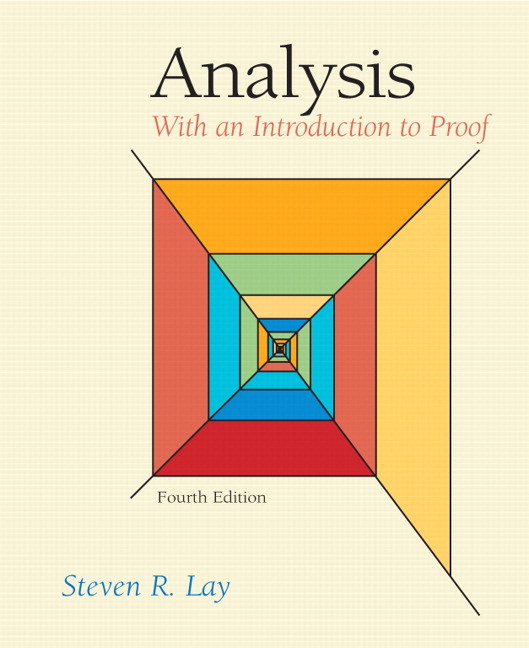 Steven R. Lay, Analysis with an Introduction to Proof, 4/E. available at the University Bookstore @ Stony Brook. Office Hours Office hours are tentatively scheduled for Tuesdays and Fridays, 4  5PM, Math Tower 4-108. Additionally, I am advising in Math Tower P143 on Tuesdays, 11AM12NOON. You may also contact me to schedule an appointment. Attendance is mandatory. Coursework for in-class projects and quizzes make up a significant part of the final grade. Quizzes are governed by the same rules as other exams. The current plan is to have weekly quizzes during Wednesday class meetings. However, if attendance becomes a problem, these may become "pop quizzes" to encourage attendance. Missed coursework and quizzes will only be excused if there is a valid excuse (work-related absences will not be excused). The lowest quiz score will be dropped when computing final course grades (this could include one missed exam). Graded problem sets, quizzes, and exams will be handed back in lecture. If you cannot attend the lecture in which a problem set or exam is handed back, it is your responsibility to contact the instructor and arrange a time to pick up the work (typically in office hours). Term Paper Part of the coursework for the semester will be a term paper, 10 pages in length, on a topic related to analysis. This may be a topic in the history of analysis, a biography of an important analyst, a topic about applications of analysis in other areas, etc. However, every term paper must include a correct statement of a mathematical theorem not already covered in lecture, as well as a correct explanation of a mathematical argument. More details will be discussed in lecture. All paper topics must be submitted to the instructor for approval prior to April 15th. Here are several possible term paper projects: historical treatment of infinitesimals, invention of calculus by Newton and Leibniz, pre-history of calculus (Archimedes, Cavalieri, Descartes, Fermat, Barrow, ...), non-standard analysis, convergence of series, non-Archimedean ordered fields, history of the Completeness Axiom / Heine-Borel / Bolzano-Weierstrass / Cauchy Convergence Theorem, open and closed sets in metric spaces, history of L'Hospital's rule, Dedekind cuts, Cantor sets, history of Mean Value Theorem / Rolle's Theorem, history of the Intermediate Value Theorem / equivalence to the Completeness Axiom. Of course there are many other possible topics. Students should confirm their paper topic (whether from the above list or not) by April 15th. The University Senate has authorized that the following required statements appear in all teaching syllabi on the Stony Brook Campus. This information is also located on the Provost's website: http://www.stonybrook.edu/commcms/provost/policies/Syllabus%20Statement.doc.